I hereby swear allegiance to the Open Web. > Linux-based operating systems with Webkit browsers. Why not? This is open source after all. Both can feed off each other. Will Chrome be renamed to Internet Chrome Explorer and get features like poor CSS and HTML support too? If one OS has to die I hope it’s Android: it’s not really Linux, it’s not really Java. 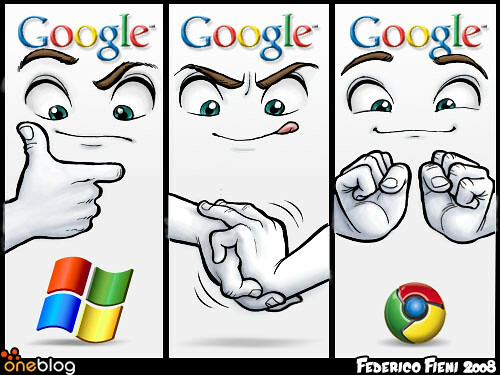 At least Chrome is really a web browser. The architecture is very similar to Cloudo, our own project. We are still in beta phase and we do have lots to do left but at least you can try it out. Have in mind that we are just a small company with few employees and we’re financing this project privately ourselves by undertaking profitable projects. @hbi: After i saw your post I was thinking.. here we go yet another web os. Not true, I am in awe of what you and your team have achieved, I can’t get over just how much work has been done to make it an almost full-featured OS and being funded off of your own back to boot. You and your team must be commended on such a fine effort. One thing I quickly noticed was commits to source code in existing applications. What happens with these? Is it stored only on the users instance or is it pushed back to a source control branch etc? ..you can see where I’m going with this right. Imagine the collboration when you have people branching and fixing bugs for you! Chrome OS looks awesome. Cloudo looks awesome too. I don’t see how the architecture is similar though. Correct me if I’m wrong, but it appears Cloudo is a web app that looks like an OS and allows file storage/sharing. And Chrome is a local desktop environment that runs over a linux kernel. Isn’t this exactly what gOS Cloud is doing? We’re already beginning to see the precursors. Flex, Silverlight, Google Chrome OS: these are being created in response to demand from consumers who want a richer, faster Internet experience and who want the Internet to play a more central role in their daily lives. First of all, thanks for the kind words. Even though I’m a daily reader of Ajaxian, I have deliberately postponed submitting anything about Cloudo at Ajaxian. The reason for this is that I don’t feel we’re anyway near a final release. Additionally, we want to avoid the cliché “promise mighty, deliver poorly”. Instead our aim is to deliver our vision of how it should be and at the end we will be judged regardless but at least we have not promised limitless blue skies. The goal is to submit/surrender applications running in Cloudo to suitable developers/groups. They will decide and plan the development branch themselves. Obviously, the open source community works for everyone’s benefits so why not absorb this process? Furthermore, IMHO, if some day Cloudo (or any other platform) becomes popular, the control as well as contribution to it should be decentralized. Of course we’ll organize some important applications in Cloudo, such as Finder and the core of Cloudo. Our intention is to offer Cloudo for free and we want to deliver a solution so that the developers/groups share revenues from potential banners (or whatever commercial ads they add) so that their work in fact is rewarded. I think you see where I am going with this but have in mind that this is our goal. It might take some time before we’re there. Once again, thank you for taking a positive pose towards Cloudo. But we have received criticism for not developing Cloudo faster but the reason is as stated above. We’re working with other projects as well. If you like Cloudo and what we’re doing with it, I hope you’ll have patience with us. That’s all we’ll see for the next 5-6 years. Google’s notoriously bad customer support will undoubtedly be ramped up by a person or two to handle stone walling the increased number of users looking for help. Sigh… it’s an exciting announcement, but I call bullshyt until it’s out of beta with strong customer support.